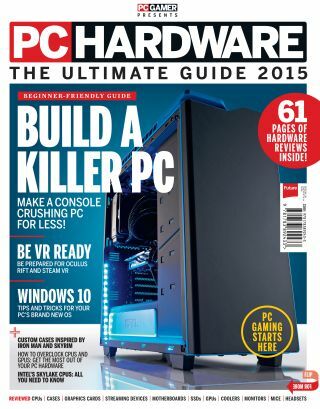 Our comprehensive hardware-focused 146-page special is out now in the UK and the US! Featuring guides on how to build a PC, tons of buyer’s advice, Windows 10 and loads more, it’s the perfect place to start if you want to build a new PC—or if you’re just looking to upgrade. You can buy it now in print for $19 (£9.99) and digitally for $8.99, from inside the PC Gamer US app. Hardware buyer’s guide for every price range. How to prepare for VR, hands-on with Steam VR, the Oculus Touch controllers, the ten best VR experiences you can have right now and more. Tips to making your PC look the part. Five of the best custom cases, including two inspired by the likes of Skyrim and Iron Man. How to overclock your CPU and GPU. Huge guide to setting up Windows 10 to get Microsoft’s new OS at its best. Impressions of Intel’s new Skylake processors. Reviews of GPUs, CPUs, motherboards, streaming devices, wired and wireless mice, headsets, SSDs, hi-res monitors and headsets.